The Anchor River is another very popular fly fishing destination in Alaska. People come to the various rivers from all over the world to catch the large Salmon that run these rivers each year. 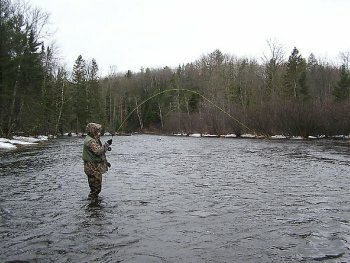 The Fly fishing can be amazing during these runs, and the season is short so you need to plan your trip early while guides are still available and the lodges still have accommodations available. The Anchor is one of the best rivers in Alaska that you can drive to. Just north of Homer, this is a local favorite and well known for its King and Silver Salmon runs as well as the amazing Steelhead fishing. In fact the Steelhead get most of the attention on this river, especially in the fall. The Kings start late in May, peaking in mid June. The fly fishing for these monsters can be very exciting. Dolly Vardens show up just after the Kings when they arrive in the river in July, and hang around through September. Then come the Silvers when they arrive in mid August and into early September. These runs can be pretty large. Then come the Steelhead. Arriving in late August and continuing through October, this river has some exceptional fishing for these large fish. The average size Steelhead is in the upper 20” range with many caught over 30”. With most of the fishing pressure on other rivers you can easily find some water to call your own and test your skills with these fish. All Steelhead and Trout are catch and release in the Anchor River. While you are in the area you may want to try the Ninichik River and Deep Creek also. These rivers are nearby and they also have good access for the wading fisherman. The Cook Inlet is here waiting for those who want to venture out for Halibut and other ocean fishing. Leave the Anchor River and look at other Alaska Rivers.